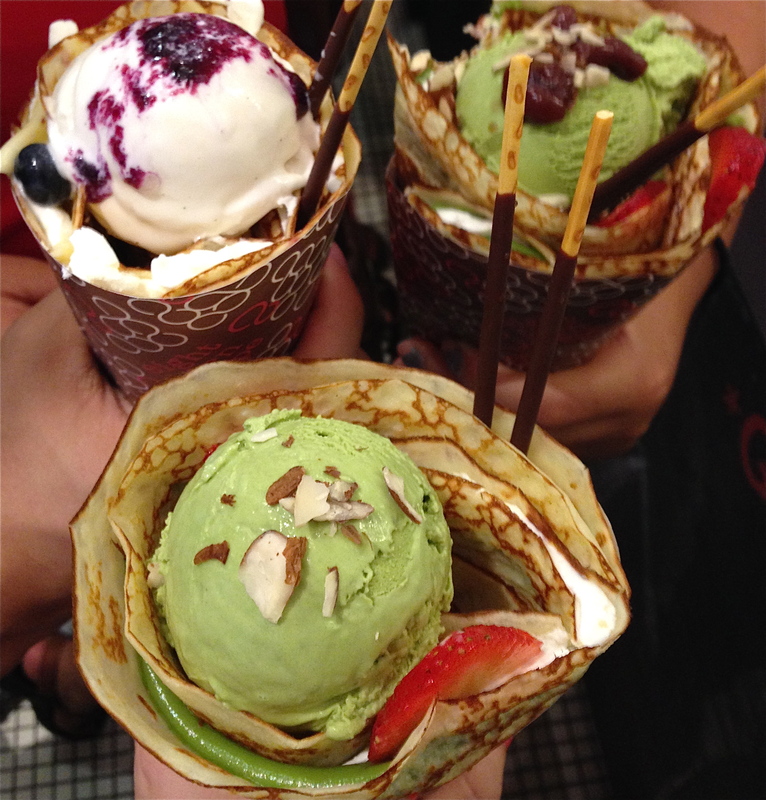 This Japanese crepe spot might be small, but it’s definitely worth checking out. Rather than using traditional wheat flour to make their crepes, Eight Turn uses rice flour. This Matcha Striped Chocolate is packed with strawberries, chocolate sauce, chocolate truffles, matcha custard cream, and whipped yogurt. Almost too pretty to eat, almost. 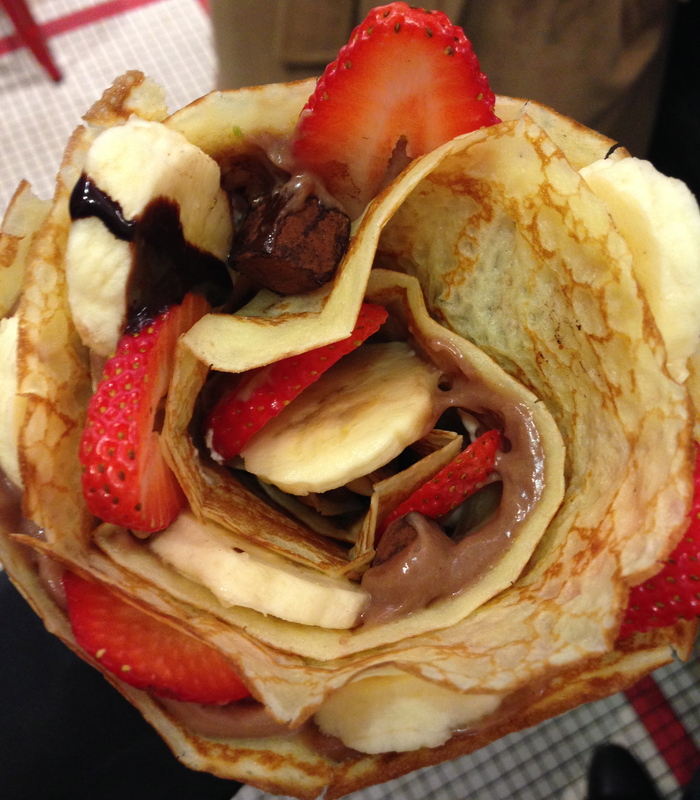 The Banana Nut Chocolate is my favorite crepe. It’s packed with bananas, chocolate sauce, truffles, and chocolate custard cream and normally, this one isn’t as colorful, but I also got it with strawberries. Customize as you please. Since summer has left us and winter will be approaching soon, honor those long gone hot days by adding ICE CREAM to an already delicious crepe. You can add ice cream to any order, but a few already come with it. The NY Blueberry Cheesecake has blueberries, blueberry reduction, custard cream, whipped yogurt, whipped cream cheese, and of course vanilla ice cream topped off with Pocky sticks. The Azuki Berries comes with strawberries, azuki beans (although I got mine without them), whipped yogurt, matcha custard cream, almonds, green tea ice cream and of course, Pocky sticks. For some reason, the Pocky sticks get me really giddy; maybe it’s because it reminds me so much of childhood. 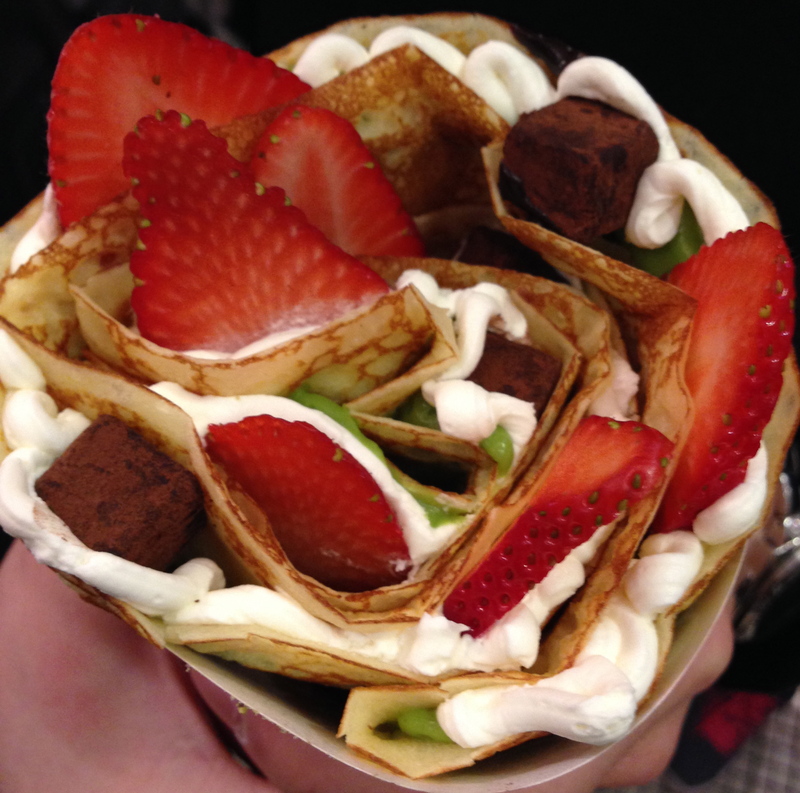 Posted in All, Crepes, Dessert, French, Japanese, Manhattan, New York CityTagged banana, chocolate, chocolate sauce, crepes, dessert, French, fruits, green tea, ice cream, Japanese, Japanese crepes, Manhattan, New York City, pocky, pocky sticks, strawberryBookmark the permalink.